Tucson Water – That Grass Cost Me What? This post has little to do with financial planning but I think many of our Tucson readers will find this analysis quite interesting. Summer season is almost upon us and as I was adjusting irrigation schedule for our yard, I got to thinking “How much is this grass going to cost me?” The answer turned out to be much harder to figure out than I thought. I’m going to use our actual household water bills in the analysis below (we are pretty close to the average residential customer in Tucson). Exhibit 1 shows the details on my most recent bill (April 2015) and Exhibit 2 breaks it down in a different way. So you have to pay $25 a month for fixed sewer and water charges just to have indoor plumbing. Then there are variable charges based on water meter readings. To make things complicated, water volume is measured in CCFs, which is a hundred cubic feet or 748 U.S. gallons. During the past month, we used 9 CCF or 6,732 gallons of potable water. This translates to household usage of 224 gallons of water per day or 224 / 3 = 75 gallons per person! For reference, average Residential GPCD (Gallons per Capita Daily) is 88 here. Total Potable GPCD in Tucson is about 130 gallons (compared to 220 in Scottsdale and 179 nationwide). So how do we figure out what it costs to water your lawn, take a shower or flush a toilet? Exhibit 3 derives costs per gallon. There are three tiers of water charges, depending on the monthly CCF usage. So it will cost you anywhere from 0.75 to 1.5 cents for each incremental gallon of water. Our household usage in the past year has averaged 11 CCF per month, but we did hit 15-16 CCF in the summer months (Exhibit 4). 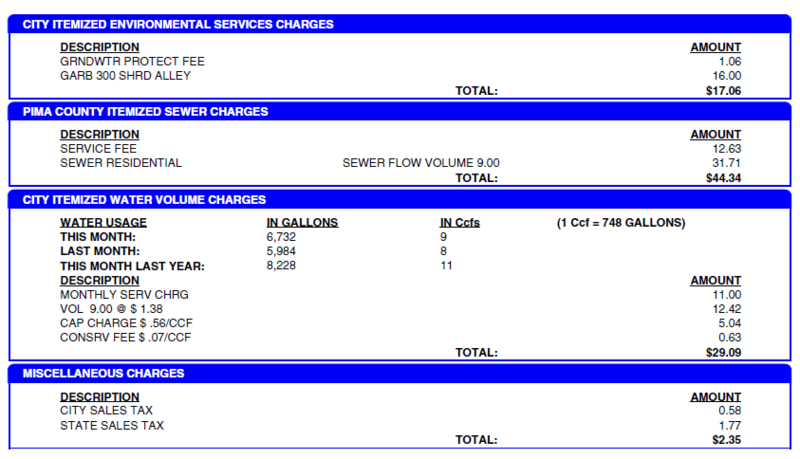 Note: sewer volume has more complicated calculations since they cap the max CCF based on three winter months. But for simplicity’s sake I’m assuming that sewer volume equals to water usage in any given month. Now that we know the variable charges per gallon, let’s estimate how much it costs to perform some common household activities (Exhibit 5). Note that you need to know how many gallons each activity takes and it’s not that easy to figure out. Also keep in mind that this is water volume only and doesn’t include costs of electricity to run the appliance OR heat up the water for it. If you were inspired to make some changes, Tucson Water has some excellent conservation tips. 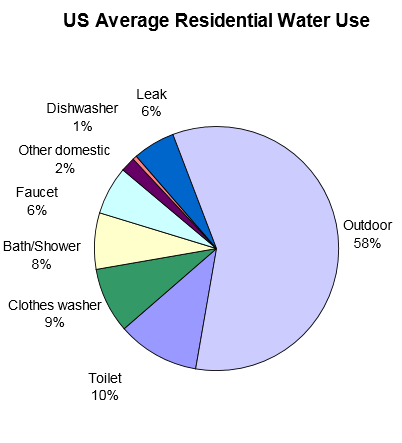 Just to give you an idea on where your water goes, here is a breakdown for average U.S. household (Exhibit 6).